The shofar is one of the most recognizable symbols of Rosh Hashana. 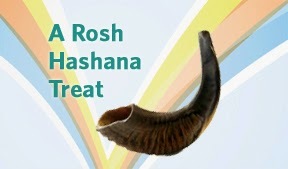 Although it is preferable that a shofar be fashioned from a ram’s horn, the horn need only come from a kosher animal. * However, not all the horns of a kosher animal are usable. For instance cows’ horns and deer antlers are solid bone and cannot be fashioned into a shofar, whereas the horns of animals such as rams are made of keratin and can be hollowed out to become a shofar. Shofars are prepared by applying heat. They are cleaned in boiling water, and heat is applied in order to either straighten or bend the horns. A shofar may be engraved or decorated with metal as long as the weight does not alter the shofar’s sound. However, extra material may not be placed near either end of the shofar. Tekiah - The tekiah is a long, solid blast like the blowing of a trumpet at a king’s coronation. This sound reminds us that God is the King of Kings. Shevarim - The shevarim are three medium-length blasts, reminiscent of deep sighs or soft crying, (where one is gasping for breath). The shevarim represents the first step in recognizing all that God does for us, and all that we could be doing, thus the sighing sound. Teruah - The teruah are nine quick staccato blasts which evoke the feeling of short piercing cries of wailing. It represents the recognition that the new year is upon us, and the time for repentance will soon pass. --A combination of Shevarim-Teruah is also sounded during the shofar service. Tekiah Gedolah - The tekiah gedolah, the final blast, is a long solid note. It is a triumphant shout that reaches out to the hearts of all to assure them that their prayers have been heard.